The apartment is on the third storey of Villa Anna - once Villa Pagliano - a three-storeyed house of the second half of nineteenth century. Located in a green, cool and quiet, it is within the walls of the castle of the Marquis of Carretto (XII sec. ), so it is not accessible by car, but with a short pedestrian street (about 70 meters), uphill when we you go back home. 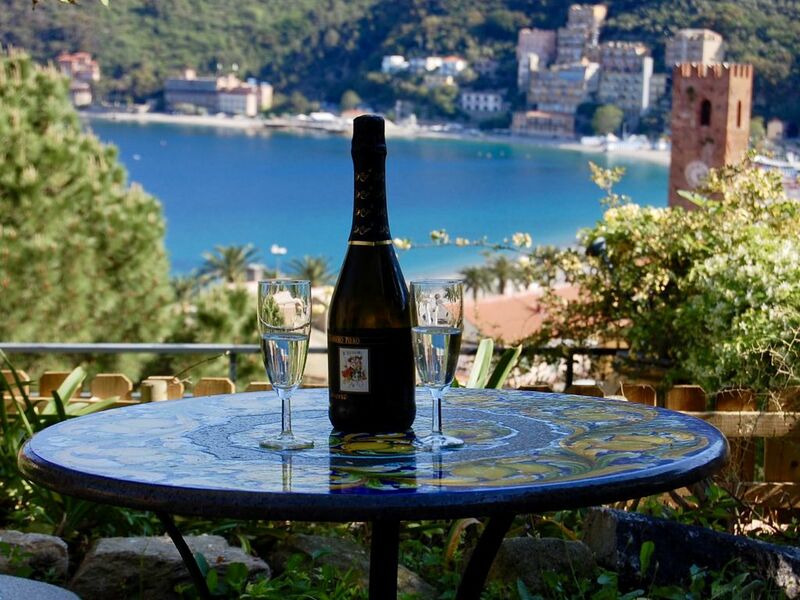 It is very close to the beaches both free and equipped and to the center of Noli - entirely pedestrian - where it is pleasant to walk through the “caruggi” (typical Ligurian narrow streets), squares, medieval houses and towers. Noli, maritime republic until 1797, is classified as one of the most beautiful villages in Italy and, as in the past, the fishermen go out to sea with “gozzi”, traditional fishing boats, and sell the fish at the market on the beach. The apartment faces with all the rooms, with terrace and with the garden on the gulf of Noli, of which offers a splendid view, really special. It has a private entrance, and a typical Ligurian garden on two levels, private and reserved for guests (its characteristics make it advisable to supervise young children while they play). It is equipped for sunbathing and enjoying breakfast, cocktails, lunches and dinners (with gazebo, table and chairs, deck chairs, sun beds, BBQ gas Weber). The interior is composed of a bedroom with double bed (200 x 160 cm), a living room (with a armchair-bed and a sofa bed with latex mattress), a dining room, a bathroom with shower and a kitchen, small but fully equipped (gas-stove with 5 burners and oven, dishwasher, washing machine, microwave, etc.). Sitting at the table on the terrace you have one of the best views of Noli and its gulf. Inside the apartment smoking is prohibited. The WIFI is free. The apartment in Villa Anna was clean, well equipped, surprisingly spacious and a pleasure to stay in. It has wonderful views out of every window, and a comfortable garden with castle walls behind and also with views down over the town and sea. The lack of car access was potentially difficult but we had friendly help up with the suitcases as part of the deal, and as we got used to it the walk up past the bishops palace turned out to be a delight (and easy enough for the two older members of our party). It's only a short walk down to the town centre. The owners were resident in their apartment downstairs for some of our stay, and they gave us warm welcome. They also went out of their way to help one of our group with a travel problem which was much appreciated. We were delighted to stay in Noli, the wooded hills around it have kept it small, we could watch the fishing boats leave in the morning from our balcony, and see the size of the waves to decide whether or not to swim. We took great pleasure in finding out about the history of the town as a maritime republic, and exploring the medieval centre. There are well marked footpaths up into the hills, and I would have liked to spend more time exploring the local countryside. We had a wonderful holiday, my memories are permeated with the smell of jasmine which seemed to be growing everywhere. I was very happy to have chosen the Villa Anna - I'd recommend it to anyone. "Very unique location and view, very well equipped, everything taken care about you. Only parking can be an issue to be known about. We enjoyed dining on the terrace and the views on maximum." Uns haben die Ferientage in der Villa Anna sehr gut gefallen. Dear friends, we are so happy that you have loved your Noli's holidays! We thank you very much for the photo of your walk around Noli and we hope to have the possibility to meet you in the future! Wir waren schon zum 2. mal in der Villa Anna. Die Lage ist toll, nur ein paar Minuten zu Fuß in die Stadt und ans Meer. Wir wurden sehr nett empfangen durch Simone und haben tolle Tipps für unseren Urlaub erhalten. Der Blick, den man vom Balkon aus genießt, ist einmalig schön. thank you very much for your kind words. We are always so happy if our guests can have a beautiful holiday in Villa Anna!! we hope to have another chance to meet you in the future! Wir hatten eine tolle Woche in Noli. Die Wohnung ist wirklich traumhaft gelegen. Von der Terrasse und vom Garten hat man einen grandiosen Blick auf Noli. Bei sonnigem Wetter waren wir immer am Strand, der in wenigen Minuten zu Fuss erreichbar ist. Wir haben unser Auto auf dem Parkplatz des Hauses dazu gemietet. Er ist zwar 15 Minuten zu Fuss entfernt, erspart aber die Mühe jedes mal einen Parkplatz zu suchen. we are so happy that Villa Anna has been a beautiful place for your holidays! we love our home and we really like if also our hosts do the same! Thank you so much ! (Text automatically translated) The villa is accessed via a short walk, you can not get in the car.